When you are in the market for a new floor, but you don’t quite know what you want, visit the flooring experts at our showroom to discover the diverse variety of options that are available to you. Flooring America has the area’s widest selection of attractive flooring. We are sure to have something to satisfy any design preferences you have. Among our rich variety of flooring options, such as carpet and hardwood, we carry laminate wood flooring in Great Falls, MT, that provides you with an unmatched combination of durability and beauty. Laminate has quickly become one of the most popular choices for flooring that we offer, and the reasons are obvious. It comes in a huge array of styles, boasts unbeatable durability, and the laminate flooring prices are simply unmatched in their affordability. Laminate mimics other more expensive flooring types, allowing you to lend elegance to your home that will last for years. If you’ve always wanted hardwood flooring throughout your home, yet are worried that the porous nature of the surface is not ideal for wet locations such as kitchens or bathrooms, don’t worry. It is still entirely possible to get the look of hardwood in your bathroom or kitchen by coming to us for laminate flooring installation. Thanks to advances in the manufacturing process, we are able to make laminate look and even feel almost identical when compared to natural hardwood. Come by our showroom and see all the varieties of colors and grain patterns that are available to you, imitating the hardwood down to the grooved surfaces and knots. Add to that the ever-improving resistance to water, stains, mildew, and scratches, and you have a type of flooring that is perfectly suited to a busy home. Make sure that your brand-new laminate flooring lasts as long as it possibly can by relying on our experts for the installation services you need. The techniques used by contractors in the industry have been refined over the years, and our team stays ahead of the game. We have the experience and expertise necessary to install your new floors flawlessly. We even offer fantastic warranties on all of our installation services. During the entire lifetime of your floors, we repair any installation-related problems for you at no cost whatsoever. Our installation experts perform the laminate flooring installation services like clockwork. We come to your home at a time that is most convenient for you with everything needed to install. Our services are so well-planned and efficient, that we are able to get in and out before you even notice your home is being renovated. We clean up after ourselves thoroughly, leaving nothing behind save the gorgeous new floors we’ve installed. 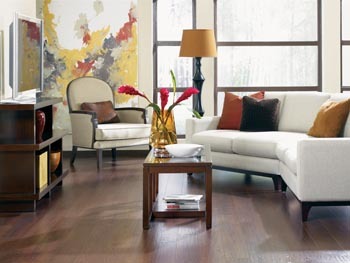 We feature laminate styles manufactured by the industry’s leading names. For superior home flooring that doesn’t put you over your project’s budget, explore the many possibilities that out laminate flooring offers. With laminate, you can achieve a sophisticated interior design for a fraction of the cost of using hard surface materials. Laminate is the no-fuss, long-lasting flooring solution that’s ideal for busy households. Use it in your high-traffic areas for easy-to-clean flooring that still looks new even years later. At our showroom, you’ll find the right laminate flooring to satisfy your personal tastes and your budget. Our goal is to make your next home improvement project a success. While the material may be very well-suited for kitchens, bathrooms, and other rooms that see a lot of water use, that does not mean you have to limit yourself to those rooms. Laminate flooring is an affordable alternative to natural materials that look great in any room it graces. Enhance the elegance of hallways, bedrooms, and dining rooms by selecting the attractive laminate that’s right for you. With this flooring, the sky’s the limit. Its diversity and durability make it a perennial favorite among homeowners who want stylish flooring at a cost-effective price. Our friendly associates and here to help you discover the laminate that’s perfect for your project. Come and talk to us today about what you’re trying to achieve. At our showroom, we are committed to your complete satisfaction. There’s a reason why we are the most recommended flooring destination in the area. In addition to our affordable pricing, special discounts and financing options, and extensive inventory, we pride ourselves on our always courteous and helpful customer service. Whether you know what kind of flooring material and design you want to purchase or you’d like some inspirations and guidance, we make sure you leave with exactly what you need. When you shop with us, having a pleasant and productive experience is our guarantee. Start your home upgrade today--we’re waiting to show you what’s new in the word of the laminate. Contact us today to learn why so many people are turning to laminate as an alternative to natural materials. We are proud to serve Great Falls, Monument, Black Eagle, Vaughn, and Fort Shaw, Montana, and surrounding areas.